Sus2, Sus4, Sus7 or just plain Sus? I’m in Suspense! Home / Music Theory for the Bass Player / Sus2, Sus4, Sus7 or just plain Sus? I’m in Suspense! Sus means suspended – what we are suspending here is the third of the chord, so a sus2 or sus4 chord is essentially a chord with “something else” instead of the third, which leads to it being less stable and not defined as major or minor. This “something else” can be the second or the fourth. Or the 7th can be added, hence sus7. In classical theory these kinds of chords have to be resolved, there are rules to be followed so that the ear is pleased. Suspended chords create a slight rub or tension and back then the ear wanted that to resolve into beautiful triads made up of thirds. These days our ears quite like a bit of a rub and we do not worry about suspended chords not being resolved. Pop tunes use a lot of these chords because they can create a nice floating feel, for example. The Police, U2, The Beatles… unresolved suspended sound abound! As an aside regarding tension and resolution: even the tritone as part of the dominant seventh chord, which has even more tension than a suspended chord – need not be resolved these days. We quite like the rub and can play a blues in the key of G, for example, where the seventh chord would be used on the root, sub-dominant and dominant. No problem, it just sounds bluesy! What kinds of sus-chords are there? Sus2, sus4, sus7. Sus4 is way more common, so sometimes we get lazy and just refer to sus4 as a suspended chord. Csus, thus, means Csus 4, in terms of notes: CFG. Chordal instruments can play notes in any order to fulfill the chord assignment. This is cool because you can play CFG by stacking fourths: G- C-F.
Sus2 means the Second is played instead of the Third: CDG. A nice sounding voicing for this chord is to stack perfect fifths: C-G-D. Because of it’s open sound it also works well on the bass even in the medium-low range. D/C (which depending on context and voicing can be heard as not being an inversion of D7). This creates a #11 sound, which is typically not heard/perceived the same as sus chords with a perfect 4th. It’s heard as a Lydian sound. But it is technically still a sus chord). As a voicing try (on a 5 string bass or a piano) C-G D F# A (C-G ensures that this is not a D7 inversion). What other sus chords are possible? Sus b9, sus #4 maj7, sus 2 maj7 (G/C); sus b2 7 (or maj7 = strange). Put your experimental hat on and share your findings in the comments. The truth is, chord symbols are always just an approximation. The most important and sound defining factor is not whether the chord symbol specifies sus2 or sus4, but that there is no third. Sus7 adds the minor 7th to the sus sound and 7 or not, that makes a noticeable difference in chord density and color! Sometimes the 2 or 4 may be in the melody, so the composer may point to that by specifying a sus2 or sus4. What does all this mean for the bass player? Chordal instruments may do 2 or 4 and it will always fit. As a suspended dominant, it has to be the sus4 for the expected effect (suspending the leading tone). That said 2 and 4 will go together nicely in most suspended chords anyways, so if guitar susses 4 and you stick the 2 in there as part of a melodic bass line, all is good. We are responsible for the root and then making a cool line for the rest of the bar, so roots, fifths and also sixths are safe bets. And of course as we think about all these notes, we must always keep a juicy groove going. I hope this helped you suss out a bit about them suspended chords. For more info on these types of chords, check out my book. 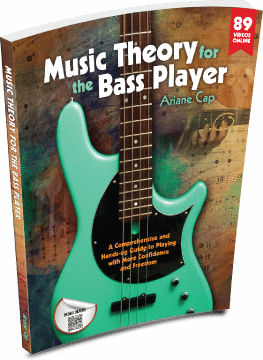 The 20 unit music theory course also practices them – by making grooves and doing reading drills, so you don’t have to worry when a sus2, 4 or 7 pops up in the chart.